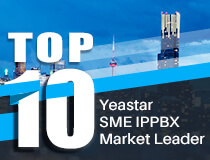 This guide introduces how to provision Polycom IP phones with Yeastar S-Series VoIP PBX. Note: Before provisioning the phones, you must reset the phones to factory defaults in case that the phones have residual settings of a previous configuration. Follow the steps below to do auto provisioning for Polycom phones. Connect the phone to the same network with Yeastar S-Series PBX. Disable local DHCP server in your local network, e.g. disable DHCP server on Linksys router. Go to “Auto Provisioning” App. Click “Scan”, all the phones in the local network will show up on the page. Search the phone by MAC address or IP address, and click “edit”. Choose the phone Model, active a line and assign an extension for the phone. You can also configure keys, features, preferences and codec for the phone. The system prompts you to reboot the phone, click “OK”. Reboot the phone manually, the phone will restart, then reboot again to apply the configurations automatically.